How about some weekday BONUS EXPERIENCE for our All-Access members? 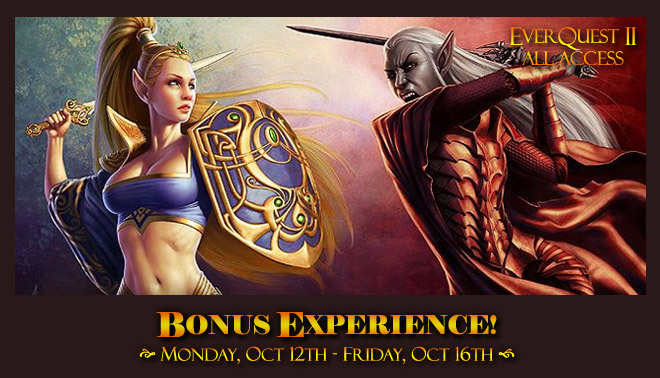 The +100% experience bonus for Adventure, Tradeskill and AA XP will turn on at noon PDT* on Monday, October 12, 2015and run until noon PDT on Friday, October 16, 2015! Bonus XP will be available for All Access members on all traditional servers. While the bonus will not be available on Stormhold and Deathtoll, there are still exciting adventures awaiting All Access members on those special servers. Remember, you must be a member to access Time-Locked Expansion servers. What about a week with a decent (more than the 0.0001% chance) chance to drop the (whistle) belt in Distillary? I’m farming the heroic instance, the event and the event HM and the chance is ridiculous.